Breathing is one activity that should be so easy that you don't have to think about it. You inhale, you exhale. It should be automatic. But that's not how it always works when you have asthma. What happens during an asthma attack. 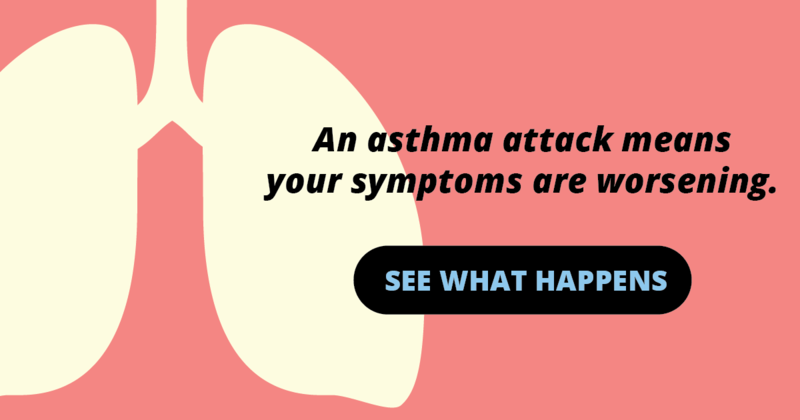 Find out what happens when your asthma flares up. With asthma, your airways (tubes through which air flows in and out of your lungs) are supersensitive. They tend to be in a chronic state of redness and inflammation, and the tiniest things can aggravate them—things like pollen, dust, smoke, fumes and pet dander can trigger a full-blown asthma attack. When you inhale one of your asthma triggers, it sets off a series of events. First, the inflammation and redness in your airways worsen. In reaction, the muscles that surround your airways tighten. Your airways—already narrowed by swelling—become even smaller. Airflow is restricted. Another reaction to the aggravating trigger: Cells in your airways start producing more mucus than usual, further restricting the flow of air. You're now in the midst of an asthma attack. Wheezing. You may notice a whistling or squeaking sound that occurs when you breathe. Coughing. You might cough more at night. You might also cough up mucus. Shortness of breath. You may feel like you can't catch your breath or get air out of your lungs. Chest tightness. It might feel like something is squeezing or sitting on your chest. It's important to treat these symptoms as soon as you notice them. HOW CAN YOU AVOID ASTHMA FLARE-UPS? Identify your asthma triggers. Allergy tests can help with that. Once you know your triggers, you and your doctor can work out ways to avoid them. Work with your doctor to make an asthma management plan. This plan will spell out what your medications are, when to use them and what to do when your asthma is worsening. A peak flow meter is an important tool for asthma management. By using it regularly, you can stay on top of your symptoms and work to reduce them before they get out of control.